Beginners to Photoshop: Photo Editing is Easier Than You Think! Today’s before and after Photoshop Blueprint was sent in by Erin Niehenke Photography – she has only been using Photoshop for a few months. Below is her edit, and a list step-by-step of what she did. This is impressive work from someone so new to Photoshop! Opened image in Photoshop’s RAW editor (Adobe Camera Raw) – increased exposure slightly, as well as blacks, fill light, and clarity. After creating a duplicate background layer, used the patch tool to remove the white speck under her left eye, a stray hair under her right eye, and the horizontal hair under her left eye. 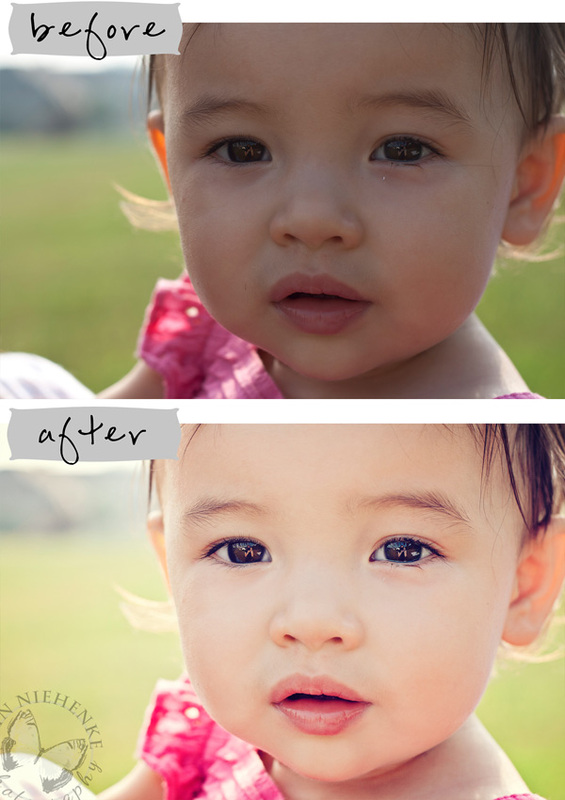 Used a brush at 15% opacity, colored matched to her skin, to smooth out her skin a small amount. Used the patch tool at a low opacity brush set to “Lighten” mode to remove some of the yellow tone the sun caused in her ears. Ran the Color Fusion Mix and Match Photoshop action (MCP Fusion Set), using Desire at 39% and Lemonade Stand at 25%. Increased the “Brighten It” layer inside One Click Color to 68% to brighten up to underexposed image. Ran Exact-o-Sharp, (MCP Fusion Set) and painted it on with a 50% opacity brush on her eyes and mouth. Ran Dodge Ball (MCP Fusion Set) and painted it on with a 10% opacity brush on the light parts of her eyes. I need advice… I have been doing photography for fun for awhile now, but am ready to get serious. So far I have been using online editing sites. Now I’m wondering what I need to do more advanced editing… Photoshop (which one), Elements, Lightroom? I would love some advice. Wow! What an incredible editing job! I am fairly familiar with photoshop, but I don’t understand what an “action” is and how to use it. Well, I suppose I do understand that an action is just a preset series of steps that you can automatically run. However, if I download an “action” I have no idea how to download and use the action. I am sure you have probably explained this somewhere, but is there any chance you can point me in the right direction? THANK YOU SO MUCH!! Wow, it is much easier than one would think for such fabulous results. I am going to have to play around with my fusion a lot more than I have been. Can I do this with Photoshop elements 7? How do I use a RAW image?? Nice edit! Only complaint I have is you can clearly see the photographer’s reflection in her eyes. I still have difficulty deciding what to do with the different layers of the actions and I’ve been using them for almost a year. This is very helpful! Thank you for sharing this. @Tessa you can use Fusion (and Eye Doctor!) with Elements 9. If you visit the “actions” page you can get all the details and little tutorials, too. They are the BEST! Amazing!!! I need to practice more. THank you so much! Wow! Erin did a great job! I love that she documented her steps. Thank you for sharing! I will be doing some editing today and will be opening some older shots using ACR. Can this kind of stuff be done in elements 9? Yes… check out the Elements 9 actions. can you do this in elements 10, i have tried to color match as far as the skin to smooth it out but it never works right. Sorry, but I’m new here….how do I check out the Elements 9 actions? This is beautiful. I have just started using Photoshop and it confuses me so much I get frustrated and quite, then I go back to my online editing software which I love. I would like to learn more about Photoshop but some of the turorials are confusing to me… Thanks for sharing! What online software do you use? Wow – I really need to photoshop…I have the software just never used it. Thanks for the info!